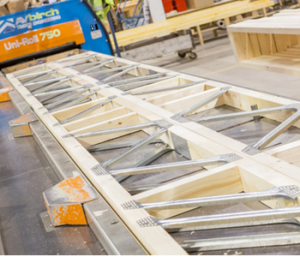 The SpaceJoists™ floor system – with its open web design, is the most versatile floor joist in the market and is widely used by housebuilders and commercial property developers across the UK. Not only does it allow for the easy installation of services and mechanical heat recovery systems, it also offers the best acoustic performance comfortably outperforming all UK building regulations. Also known as Ecojoist®, SpaceJoists™ consist of parallel stress timber flanges joined with engineered V-shaped steel webs with nailplated zones supplied from Gang-Nail®. The result is an easy to install floor and flat roof system, and with its open web design, enables fast fixing of plumbing and electrical infrastructure. More questions? See our Spacejoist FAQ. Open web system – No need to notch or drill for pipes and cables! SpaceJoists™sizes are compatible with those of solid joists – No need for expensive drawing changes! Lends itself for use in heat recovery systems (complying with code 4). Virtual elimination of shrinkage – No more call backs! Joists are made to measure – No site wastage! Retrospective installation of additional services with minimum disruption. SpaceJoists™are 40% lighter than equivalent solid joists – easier handling on site. Wide surfaces – easy flooring and plasterboard fixing. Long continuous spans make SpaceJoists™ ideal for flat roofs and eliminate the need for intermediate support walls. SpaceJoists™are compatible with under floor heating systems. SpaceJoists™work with all standard fitting techniques and fixtures. Designed to be compatible in size with solid timber sizes and brickwork.